Voted Third Best Seasonal Hostel worldwide by Hostelworld, Fresh* Sheets offers a choice of 4 bed and 6 bed dorms and a cozy double room with a sea view in a character four story building located in a quiet neighborhood. The hostel offers comfortable beds in spacious 4 bed and 6 bed dorms. 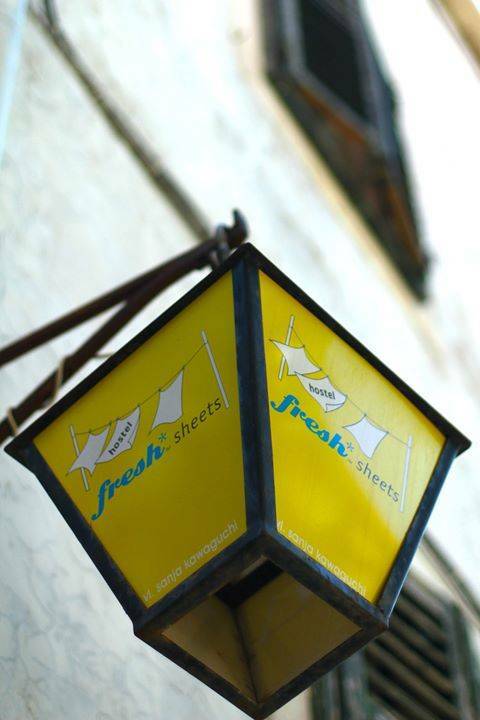 Total amount of your first night will be charged if you do not notify us about your cancellation or any changes by 4 to 2 days before your scheduled arrival.
.:DIRECTIONS TO FRESH* SHEETS, DUBROVNIK, CROATIA:. If you arrive by automobile, the city recently completed a huge parking garage located @ 15 minute walk from the Old City gates. It is probably your best option and safer than parking on the street where the city police are renowned for ticketing and towing cars. When you drive into Dubrovnik, you can't miss it. There is a very very large sign. From the parking garage, take a bus or walk to the main gates. The instructions for finding the hostel from the main gate is listed below. Upon arrival, your cheapest option is to take an airport shuttle (@35 KUNA) which picks up passengers outside the arrival hall and drops you off just outside Pile Gate (main entrance to the Old Town). Airport taxis are available as well (@250 KUNA). The taxi line is next to the shuttle bus. If no taxis are available, you can request one from the information desk.